On 18 September 1997, the Welsh electorate narrowly voted ‘Yes’ on the question: “Do you agree that there should be a Welsh Assembly as proposed by the Government?” The turnout was 50.1%. The Yes majority was 6,721. At the time, I was a student in Cardiff and very excited by the prospect of devolution. It was a chance to recognise Welsh nationality and form a different kind of democracy after 18 years of Conservative government. Like the election of Tony Blair earlier in the year, it seemed to offer a new beginning and I took the opportunity to speak to as many people as possible about it. My overriding memory of the time, however, is the indifference of most people I knew. Some were clearly in the Yes camp, especially if they spoke Welsh and/or supported Plaid Cymru. My friends who had voted Labour a few months before were far less enthusiastic. Indeed, many of those who were English seemed to regard the issue as nothing really to do with them. Some actually stated it should be a decision for those who were Welsh rather than living in Wales. Even amongst those who were Welsh, there was sometimes a sense that somehow this was a vote on whether Wales’s future should be in the UK. One friend from a Valleys town was distrustful of my arguments because she said I was too “into the Welsh thing”. Others seemed to feel it was too soon after the election of a new government to make such a decision. The Tories had been in power nearly all our lives and some people seemed to want to see how government by New Labour would pan out first. Few such people probably voted ‘No’ but not many voted ‘Yes’ either. There may have been little enthusiasm but there was also little active hostility. Only one person told me he was voting No because he wanted less government, not more. Looking back, I can’t remember why I did not get involved in the Yes campaign. Perhaps I did not know how at a time when the internet was in its infancy. I did get a Yes poster from somewhere and put it up in the window. It was the only poster on our street. Despite my numerous conversations, it never occurred to me that the Yes campaign might not win. Just as during the EU referendum, I was assuming that common sense would win out, despite the conversations I was having with people who thought otherwise. As results night progressed, and it looked like No would win, I got depressed, as much with my own misreading of the situation as with the situation itself. When Carmarthen, the last county to declare, swung the result, I was ecstatic. I felt I should go onto the streets to celebrate this momentous occasion of national importance. But I knew no one else would be there. I did open the door but it was raining. Instead, I watched television pictures of a party somewhere. In the background, I noticed the woman who lived next door. I had never spoken to her and felt a moment of guilt about the lack of community on our street. I wondered why she had not put up a poster in her window. The next day, no one seemed that excited. A friend who I had persuaded to vote Yes told me she had meant to but the rain had deterred her. I’d like to think the margin would have been better had the sun been out but that would another delusion. 1997 changed Wales forever but it did so on the back of little widespread enthusiasm. It is unimaginable that people could look on at a game of football and forget themselves in the ecstasy of a winning goal at the moment when their comrades, maybe brothers, are making gallant and stupendous efforts at the front, even sacrificing their lives for the life of the nation. The press looked to professional soccer’s authorities to follow rugby’s moral lead but, fearing financial losses and expecting it all to be over by Christmas, the FA and Football League decided to play on. The FAW followed suit with its president claiming that to interfere with football would be nothing short of ‘panic legislation’. He argued that soccer fulfilled a large place in the organized life of the nation and that its discontinuation would only produce undesirable results. Although many professional players had already enlisted, and some of the smaller professional teams disbanded, those clubs that did play on faced a battle of their own. The government and the War Office may have supported the continuation of professional soccer but elements of the public and press saw things rather differently. 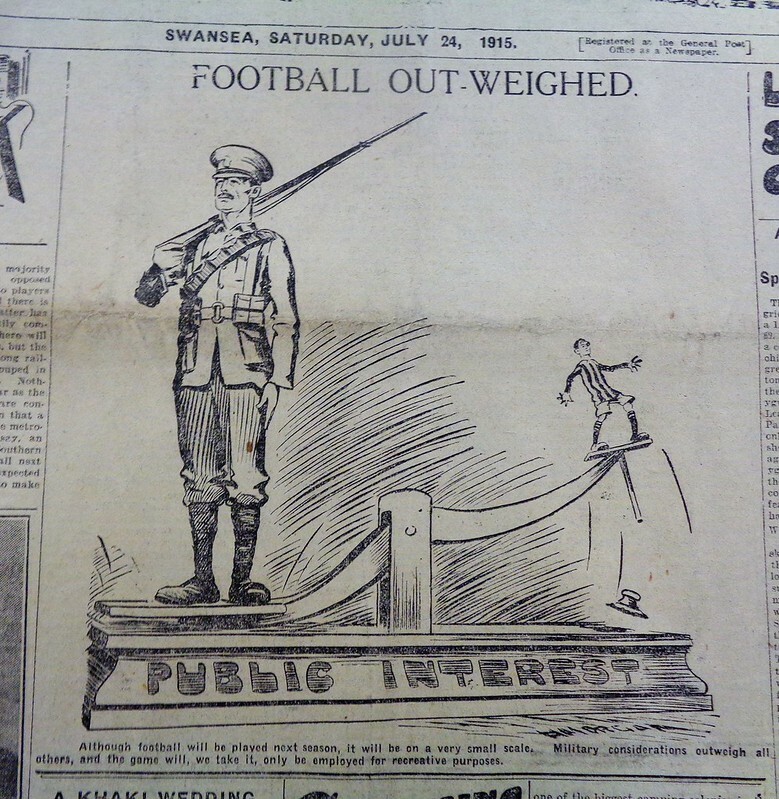 The first two months of war saw letters and editorials in south Wales and national newspapers denouncing the playing of soccer during a time of crisis. It was felt that since footballers were fit young men looked up to by much of the public, they should be setting an example by enlisting. Some critics believed that playing and watching the game were not necessarily wrong if the players and spectators were too young or too old to enlist. They accepted that sport had a role in relieving public tension and anxiety. However, the more extreme antagonists felt that the whole concept of spectatorism was wrong in a time of war and the sight of thousands of young and able men enjoying themselves at matches during wartime sickened them. 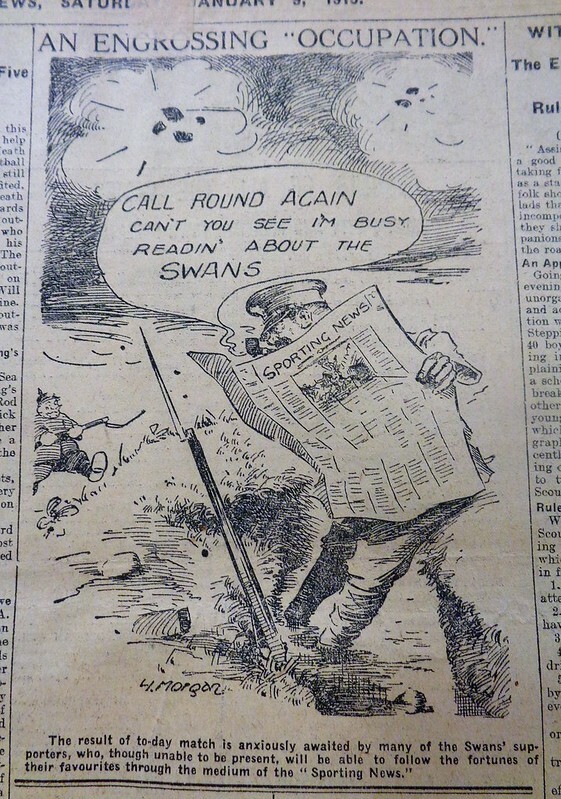 Celebrating rugby’s war contribution: Sporting News (Swansea), 5 September 1914. Celebrating rugby’s war contribution: Sporting News (Swansea), 19 September 1914. The south Wales press printed lists and pictures of famous, and not so famous, rugby players who had joined up, thus indirectly criticising professional soccer. The decision of Swansea Town’s directors to contest the military’s decision to requisition the Vetch Field was subtly criticised after one member of the board suggested that the War Office could have the ground if it took over the club’s liabilities. The implication that the club and the game were putting their own finances before the nation’s needs was made clear by the press article then moving on to look at new recruits from the town’s rugby fraternity. 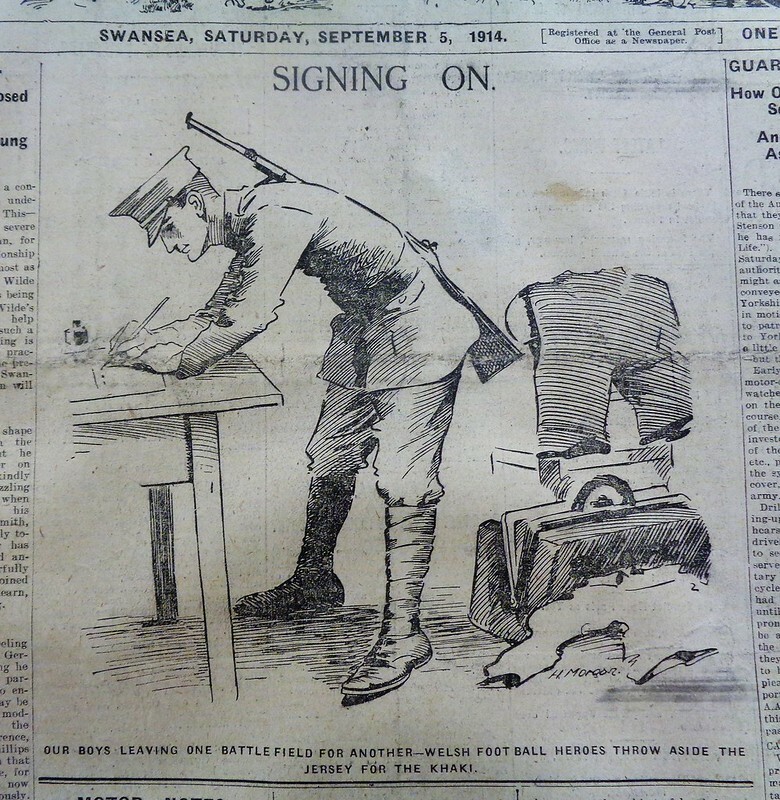 In an effort to make a stand against the continuation of soccer, the South Wales Argus announced that it would not report any football news for the duration of the war. The South Wales Daily News also chose not to print match reports in the first few weeks of the 1914-15 season but, as attendances showed that the public were still interested in professional soccer, the paper slowly increased the coverage it gave to the game. 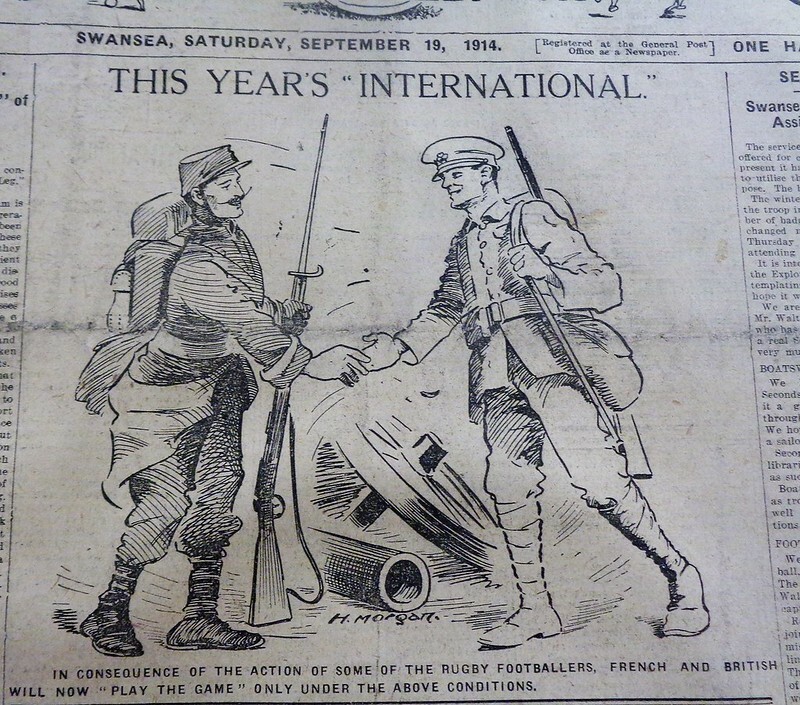 Other papers also reversed their stance and made it clear that sport was acceptable during the war. Despite the allegations that professional soccer was unpatriotic, the game was helping the war effort. Grounds were made available to the military for drill or training at any time other than Saturday afternoons, most clubs gave their players rifle practice, and some even paid them in advance for the 1914-15 season to allow them to enlist. On occasion, soldiers were let into matches half-price in an effort to show that the game was doing its bit, while spectators regularly found themselves the target of enlistment campaigns. The 7,000 spectators at a Welsh League match between Swansea Town and Llanelly in 1914, a third of whom were eligible for service according to a self-righteous reporter, were addressed by six different speakers, including the mayor and club chairman, on the virtues of enlistment. The immediate impact of such appeals was limited in south Wales. The Times used the fact that only six recruits came forward after appeals at a Cardiff City match as an example of the selfishness of the game and its followers. However, as the club pointed out, hundreds of its supporters had enlisted, while the majority of the rest were involved in the coal and rail industries, integral parts of the war effort. Nationally, soccer gave the state easy access to large numbers of potential recruits from working-class communities and thus became an important vehicle in the recruitment campaign. The wartime hostility towards soccer in England was not widespread and actually represented the resentment of exponents of amateurism at the usurpation of the game by professionalism and the working classes. In south Wales, antipathy towards soccer was even less common and given disproportionately large publicity by a patriotic press. Restrictions on rail travel and a ban on mid-week games played havoc with fixture lists and soccer found it harder and harder, in both financial and practical terms, to continue. In November 1914, the FA estimated that, on average, attendances had fallen by approximately fifty per cent. Cardiff City’s average in the Southern League dropped from approximately 11,700 to around 9,300. Other clubs, like Mardy AFC of the Southern League, already operating on tight budgets, suffered critical declines in their gates and closed before 1914 was out. The soccer authorities’ restrictions on players’ wages caused further tensions within clubs. Cardiff City players threatened to go on strike in 1915 over the issue of their benefits. By the end of the 1914-15 season, it was clear that the war was going to be a long affair and the FA decided to suspend league and cup programmes. Falling attendances and practical problems had achieved what the anti-soccer agitators could not. A new makeshift league involving Cardiff City, Newport County and teams from south-west England lasted just a season because of low gates and rail restrictions. Cardiff City’s average attendance during the season was a meagre 1,700. 1916 saw the introduction of conscription and the call up of most of the eligible professional players who had not enlisted voluntarily. Junior leagues did continue throughout the war, offering light relief from the hardships of the home and overseas fronts, but professional clubs spent the rest of the war playing the occasional friendly with teams of amateurs and guest professionals. Without the regular income of popular matches, the expense of paying rent and ground maintenance proved difficult. Cardiff City, Merthyr Town and Swansea Town survived the war but few other clubs were so fortunate. Yet the real loss was the 35,000 to 40,000 Welshmen killed in the war, among them a host of amateur, professional and international players. For those who returned, the war was a watershed in their personal lives. Fred Keenor of Cardiff City served alongside other professional players in the 17th Middlesex (Footballers’) Battalion and a leg wound threatened to end his footballing career before it had really started. In later years, he mostly refused to speak of his experiences on the Western Front. As his son put it, ‘Dad blotted it out. He had lost too many friends. He often said that he was one of the lucky ones who came back’. On being demobbed, the ‘land fit for heroes’ was no more immediately apparent to Keenor than it was to most other returning soldiers. He found work in a gasworks and on a milk round before rejoining Cardiff City when professional football resumed in 1919 amidst much excitement. Adapated from Martin Johnes, Soccer and Society: South Wales, 1900-39 (University of Wales Press, 2002). An old article I wrote for Soccer History. John Charles was one of a generation of immense talent to emerge from the schools of Swansea from the end of the 1930s to the early 1950s. Most notably, Trevor Ford, Cliff Jones, Ivor and Len Allchurch, Jack Kelsey and John’s brother Mel all went on to become international stars. In the early 1950s Swansea schoolboys won the English schools shield three times. The guidance of local teachers did much to foster this culture of footballing excellence but another local institution, Swansea Town, never benefited from it in the way that it might have. Charles was lost to his hometown club when Leeds United ‘stole’ him (and several others) from the Swansea Town groundstaff in 1948, after a scout had spotted him playing on a public park. Charles was yet to turn sixteen and was thus technically a free agent, despite an understanding that he and other boys on the groundstaff would sign professional terms for Swansea. The FA subsequently changed the regulations on player registration to avoid any repetition. After Wales qualified for the 1958 World Cup his manager and teammates were unclear about whether Charles would be able to participate or not. When the Welsh party left for Sweden Charles was not amongst them. Juventus, with whom Charles had just won the Italian league, had finally agreed to release him but he was still waiting for clearance from the Italian Football Federation. Charles himself had not thought that Wales would qualify and thus never thought a problem would arise. When he eventually made it to Sweden he was unexpected and arrived at an airport not knowing where the Welsh team were staying. Charles played in Wales’s three group matches, scoring once. In the subsequent play off against Hungry he was kicked out of the match and injury prevented him turning out against Brazil in the quarterfinal. Without their star player, Wales lost 1-0 to a Pele goal. His desire to play regular international football contributed to his signing for Leeds United in 1961. After he quickly returned to Roma he insisted on a clause in his contract allowing him to play for Wales. Charles finally played for a Welsh club when he joined Cardiff City from AS Roma in 1963. By then he had lost some pace and played mostly in defence. In 1966 he moved on to join Hereford United as player-manager before returning to Wales to become manager of Merthyr Town in 1971 and then becoming assistant manager at Swansea in 1973 after a brief spell in Canada. Charles stayed at Swansea for three years before moving to Leeds to run a pub. He was never a success in management, be it in football or business; perhaps his temperament was too genial. But this did not sully the memories of those who had met him or seen him play. With his greatest playing achievements taking place on the continent in an age before widespread television coverage, Charles was never as revered in Wales or the UK as he was in Italy. Nonetheless, he surely remains the greatest footballer ever to emerge from this small nation. Martin Johnes is the author of: Soccer and Society: South Wales, 1900-39 (University of Wales Press, 2002). In 1914, Christmas caused a break in the fighting in many places on the Western Front but at home there was disagreement over whether it should be celebrated at all. In Burnley, a mill manager tried to stop the Christmas Eve tradition of halting work for a while for ‘a little jollification’ and was punched in the face for it. The government has acted at times to keep Christmas special. The 1934 Betting and Lotteries Act outlawed gambling on Christmas Day. The 2004 Christmas Day (trading) Act prohibits large shops from opening at all. In 1940 the government decided not to bomb Germany on Christmas Day, unless there was a German attack the day before. It did not announce the truce for strategic reasons but it still hoped to get credit for the decision and had feared looking bad in American eyes if the British carried out raids but the Germans did not. Although many of our traditions date back to the Victorian period, it was not until relatively recently that they became standard practice. It was the 1950s when Christmas trees and turkey dinners became the norm for working-class families. The Trafalgar Square tree has caused a number of political controversies. In 1958 and 1959, despite protests from the public and press, the police refused to approve its lighting after 11pm for fear it would lead to drunks assembling there. A ban on importing trees after the war meant the government had to give the tree a special licence, despite the risk of bringing disease into the country. Cuts to Christmas day rail services caused problems for football fans and players in the 1950s. This meant a full Football League Christmas day fixture list was last scheduled in 1957. By 1960 there were no league games that day at all in England and Wales. In 1959, the Queen’s pregnancy meant her speech was recorded for the first time. The BBC broadcast it at 9am and it was repeated at 3pm on ITV. At 3pm the BBC instead showed ‘Chipperfield’s Circus Festival’. The challenge of scheduling against Her Majesty meant that by 1961 both channels returned to showing the Queen at the now traditional time. In 1966 the Royal Mail held a children’s competition to design a Christmas stamp. Some stamp collectors thought this undignified and wrote to the press to complain about the disgrace. In 1968 the Queen and Prince Philip decided to write the Christmas speech themselves and their draft included a reference to Britain’s ‘serious economic difficulties’. The government was unimpressed and the sentence was deleted. It was 1974 before Boxing Day was made a bank holiday in Scotland, a century later than England and Wales. All taken from Martin Johnes, Christmas and the British: A Modern History (Bloomsbury Academic, 2016). This article was first published in the South Wales Echo. Cardiff Council’s Christmas artificial tree has come in for some stick in the last couple of weeks. First, it was late appearing. Then, it turned out to be forty-foot-high rather than the promised forty metres. And then some people didn’t like it or complained that money was being spent on a tree at all. Cardiff isn’t the only council to suffer such woes. In Leicester, the civic tree was accused of first being half finished and then a gaudy mess. Some of the complaints seem rather petty or are perhaps down to people trying to be clever. Did anyone really care exactly when Cardiff’s tree went up or expect something nearly as tall as the 46m Statue of Liberty? The gripes that it is ugly or comes from China rather a Welsh forest are more substantive. They also reflect a much wider sense that Christmas trees are symbolic. Whatever kind of tree we choose for our own home is a more than a matter of simple taste. Christmas decorations are statements about ourselves. Whether we go for something natural or plastic, whether we adorn it with gaudy multicoloured decorations or a simple colour scheme, our Christmas tree is a way of exhibiting our taste or sense of fun. Yet leaving the curtains open so neighbours and passers-by can see our lit tree is not primarily about showing off our personal taste and style. It is also about sharing the joy that Christmas decorations can bring. Even the grumpiest Scrooge might admit there is something pleasant and even magical about Christmas lights on a cold and dark winter night. The first public trees in the UK probably date to the inter-war period and were seen on village greens and town centres and at railway stations. By this time, most middle-class families erected trees in their homes, but the ritual was still establishing itself amongst the working-classes who concentrated their limited resources on presents for the children and a good meal. Public trees were far more common on the continent and after 1945 around twenty towns and cities in the UK were gifted trees by European communities as thanks for their assistance during the war. The most famous was the Trafalgar Square tree, an annual gift to London from the people of Oslo. It quickly became something of a Christmas icon, encouraging more towns and cities to erect their own trees from public funds. This new trend was not without its problems. Like the other gifted trees, the Trafalgar Square tree had to receive special exemption from a ban on importing trees for fear they might bring disease. In 1958 and 1959, the police even refused to approve its lighting after 11pm for fear it would lead to drunks assembling around it. Such concerns were not unfounded. In 1953, a Royal Navy officer was charged with being drunk and disorderly after climbing the thirty-foot tree in the centre of Bristol to take the star from its top. But more generally public trees spread Christmas cheer and became part of what many enjoyed about the season. Thus in 1949 one local newspaper, while noting how common public trees had become in the southwest of England, argued they were ‘the centres of colour, life and laughter in the market places of many towns’. Public trees, however, were more than just public celebrations intended to raise festive spirits. The 1950s and 60s saw most towns and cities also start decorating their retail centres with displays of electric lights to promote Christmas shopping and the public tree became part of a wider civic display. Making Christmas shopping pleasant mattered because so many people also found the expense, decisions and crowds stressful. The ambience a tree and decorations generates compensates for that and helps make Christmas shopping a special experience. Indeed, with consumers expecting shopping at Christmas to be different from the rest of year, any town or city that does not spend money on decorations risks losing custom to a nearby rival or, increasingly, to the convenience of online shopping. A study of Manchester in 2012 found that the council’s festive lighting had cost £339,000 but that the city’s Christmas markets alone had generated £71 million in spending. Unhappy people are always more forthcoming with their views on the world than those who are content. Cardiff Council should thus take some comfort in the likelihood that their derided tree will generate more quiet cheer than vocal complaint. They should also take comfort in the fact that putting the sparkle of a Christmas light onto a winter street is not only something of a tradition in itself, it’s also good for the local economy. Online retailers have many advantages but they don’t provide a tree and lights to enjoy. Martin Johnes teaches history at Swansea University. He is the author of a new book, Christmas and the British: A Modern History, published by Bloomsbury. 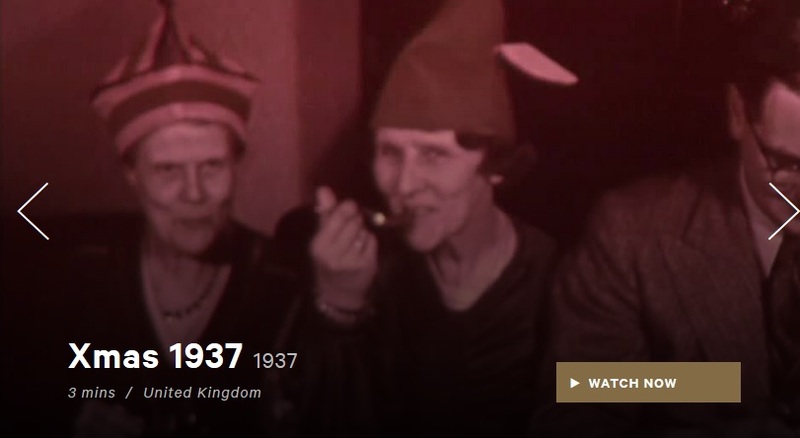 In 1958, a writer in The Times remembered that before the war older people were complaining how tawdry and commercial Christmas had become ‘but in their most disgruntled moments they had never imagined anything like this steam-roller, gathering momentum all October and November, with the London streets disguised as toy bazaars, and false Father Christmases popping up in every store’. Complaints about the commercialization of Christmas date back into the Victorian period but one of the most persistent was the claim that it was appearing in the shops earlier and earlier. Yet actually proving that assertion is not easy. What is certain is that Christmas in November is not a twentieth-century development and Christmas in October dates back to at least the 1950s. In as early as 1824, the compendium Forget Me Not was being advertised as a Christmas present at the beginning of November, complete with the claim that many people had been left disappointed the previous year when stock sold out a few days before the festival. The commercial Christmas was still very much in its infancy at this time but over the course of the nineteenth century it grew as people indulged themselves in the pleasures of food and presents, and appreciated how the festival reaffirmed social bonds. It was thus as much in response to consumer demand as a shopkeepers’ hunger for profit that advertisements for Christmas goods became very common in November in the last quarter of the nineteenth century. However, there was never any agreed date among retailers about when festive displays and advertising should begin and by the early twentieth century the Christmas shopping season was something that arrived gradually in November rather than suddenly at a set date. Ad for Santa Claus’ arrival on 8 November 1926. Includes the suggestion to ‘shop early’. Consumers, of course, did not have to respond to advertisements and displays but even early in the century, November Christmas shopping was not uncommon. In November 1921, for example, Christmas shopping was reported to be in full swing in Knightsbridge by the middle of the month. Some started well before this. On 30 October 1933, The Times was reporting early Christmas displays in large London shops and that the Queen had begun her shopping. Shops explicitly encouraged this, not just for the sake of their profits but also to relieve the workload on their staff in December. The war and subsequent austerity curtailed this, at least temporarily. In 1952, it was noted that Christmas was now concentrated in the week or two before the day itself and the time of its stretching back into November was gone. That did not last and the return of affluence renewed and enabled people’s desire to spend at Christmas. Just a year later, there were reports of a Christmas tree being put up outside a Leeds store in October. In 1959, the first decorations in Oxford Street went up on 22 October. Even some children were put out at the fact that Father Christmas was in some stores in October. ‘Christmas is lasting too long these days’ remarked one lady to a television reporter in October 1959. In the same year, Coventry City Council responded by banning shops putting illuminated trees up outside before 1 December. Christmas in October may have been thought by some to be too early but the logistics of supplying and storing festive goods encouraged shops to erect October displays. Local authorities too had played their part in pushing the date back into October by deciding when to erect their street decorations. In 2008, when town centre decorations went up in Coleford (Gloucestershire) on 12 October, even some traders were upset but one shopper told a paper that the decorations were ‘splendid’ and it was better to enjoy them for three months than three weeks. Although some hated Christmas shopping, more saw it as a fun, pleasurable and exciting activity, something to be indulged in over a number of trips rather than cramped into a one stressful day. A vocal minority complained about the early Christmas but the silent majority shopped away. Throughout the 20th century, retailers thus claimed that early starts were a response to consumer demand. In 1926 Selfridge’s were justifying Christmas preparations in November by saying that anticipation was a central part of the season’s enjoyment. In 2002, Debenhams, who put up its Christmas display on 20 October, claimed that if they did not do this they would get hundreds of complaints, while Marks and Spencer claimed that half of their customers wanted to buy Christmas items in October. In fact, for some people Christmas shopping was a year-round activity. Even in the 1930s there is evidence of people making lists throughout the year of anything they saw in the shops that would make a suitable present. As pockets deepened after the war, this extended to some people actually buying presents all year round. This was partly because they enjoyed buying presents but it also spread the cost and avoided the pressures of shopping in December. A 1973 survey found that 56 percent of respondents had started thinking about Christmas shopping by 8 November and 28 percent had actually bought some presents. There may not be much evidence that Christmas in the shops has got earlier since its clear encroachment on October in the 1950s but it is undoubtedly the displays and advertisements that mark the arrival and approach of the season in the public mind. Not everyone approved but there was little they could do about it when consumer demand was big enough to make the October and November efforts of retailers worthwhile. Martin Johnes is author of Christmas and the British: A Modern History (2016). Available all year round and not just at Christmas. I’ve seen the old traditions dying one by one. Grace, dignity, feeling for the past. All that matters here today is a fat banking account. You’re trying to run the school like a factory for turning out moneymaking machine-made snobs! You’ve raised the fees, and in the end the boys who really belong to Brookfield will be frozen out, frozen out. Modern methods, intensive training, poppycock! Give a boy a sense of humor and a sense of proportion and he’ll stand up to anything. Historians more than anyone should be aware of the dangers of nostalgia but as universities spend the next few days pondering, proclaiming and panicking over the results of the Research Excellence Framework, it will be difficult not to think this is not what education should be about. 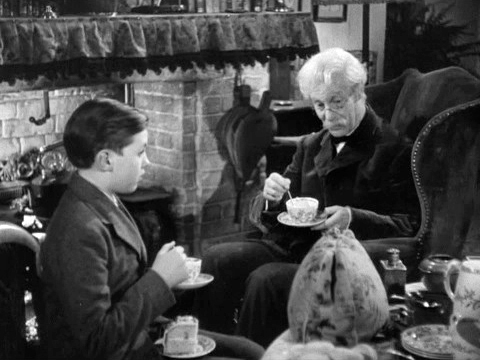 The Victorian public school system is hardly a model for what universities should be doing in the 21st century but Mr Chips understood that education is about far more than things that can be quantified, monetized and put into boxes or league tables.